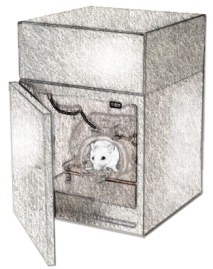 In the pre-pulse inhibition (PPI) procedure, the rodent is placed in a small chamber and exposed to a brief pulse of noise. The test is used to assess the subject’s ability to "gate" or filter environmental information. In the acoustic (startle model) of sensorimotor gating, a weak acoustic stimulus (ie, the pre-pulse) decreases the reflexive flinching response (startle) produced by a second, more intense, stimulus (the pulse). Prepulse inhibition is a cross-species phenomenon (ie, it is present in mammals ranging from mice to humans), yet it is relatively absent among schizophrenic patients and, more recently discovered, among patients with Alzheimer’s disease. The reduced ability to filter out irrelevant auditory stimulation is a characteristic thought to contribute to certain manifestations of these conditions including inattention, distractibility, and cognitive deficits. The test is quite useful for evaluating transgenic models of schizophrenia as well as to screen potential antipsychotic drugs.